The twin bomb misery has roused many questions about the peaceful elections in the country. On Saturday morning Turkish capital was hit by two devastating explosions; in the heart of Ankara. Which caused more than lives of 80 people who had gathered for a peace rally and heightening tensions just three weeks before snap parliamentary elections. 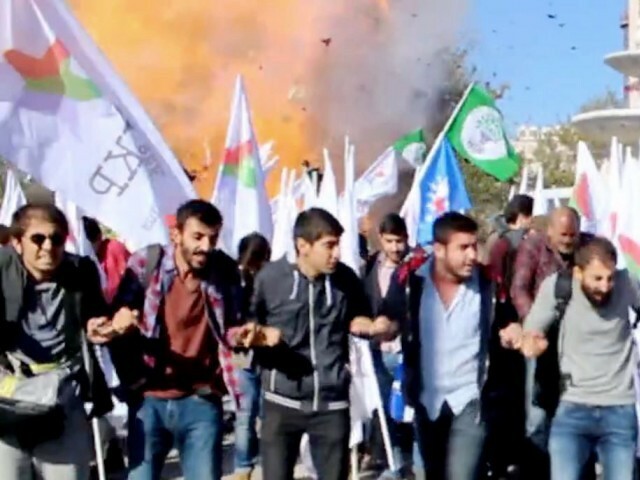 As per reports two suspected suicide bombers hit a rally of pro-Kurdish and leftist activists outside Ankara’s main train station on Saturday, weeks ahead of an election, in the deadliest attack of its kind on Turkish soil. Witnesses said the two explosions happened seconds apart shortly after 1000 a.m. as hundreds gathered for a planned march to protest over a conflict between Turkish security forces and Kurdish militants in the southeast. The country’s current instability has become increasingly intertwined with the broader unrest in the Middle East, an area whose fortunes Turkey has sought to shape in recent years by holding itself out as an example of a healthy democracy in the heart of the Muslim world. One of the resident told to international media agency that any terrorist activity was expected before elections but no one had idea that it would be of this extent. Turkey is facing a number of destabilizing forces: violence related to conflicts with Kurdish rebels and the Islamic State group, political instability, economic uncertainty and a growing flow of refugees from the civil war in Syria. This can make more difficult situation for the authorities to maintain peaceful elections.